birthday boy – Edna O’Brien marks Samuel Beckett’s centenary by dispelling some of the disinformation about the laureate. all-pro – Snow Wildsmith, youth services librarian at Mooresville Public Library (SC), has set out to read nearly 1,200 children’s books by year’s end. doncha just LOVE that name? boondoggle – The Guardian’s Culture vulture takes on the Google gobbling, just in time for Google to announce it’s plan to cut publishers in on profits from their own books. isn’t that sweet of them? super-mitzvah- the results of PBA Galleries auction of Beat Material previously belonging to Edwin Blair of New Orleans, who gave it up to to help out Gypsy Lou Webb, (one of the publishers of some of Bukowski’s earliest works) who was Katrina-ized. tattler – NYT profiles Bernard Malamud’s daughter who has written about her father: My Father is a Book. mia – Danish writer Peter Hoeg, (Smilla’s Sense of Snow) on May 19th. Den stille pige, (The Silent Girl) only a Danish version is planned. 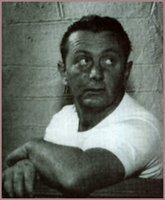 resurrectionists – Salon profiles John Fante Why do people jump all over themselves as if they just discovered authors who the rest of us never figured had gotten lost to begin with? • Nominees for the 26th annual Los Angeles Times Book Prizes were announced, and the newspaper’s Robert Kirsch Award went to Joan Didion.